Fear of psychiatric inpatient hospitalization is one of the main reasons that older men who are at high risk for suicide don't talk about suicidal thoughts with their physicians, reports a new study. The findings of the study are published in the journal Patient Education and Counseling. The MAPS assessment was led by Anthony Jerant, chair of family and community medicine at UC Davis Health. Jerant and his team created MAPS because 80 percent of suicide deaths occur in men, with the biggest increase in the past two decades among men between the ages of 35 and 64. 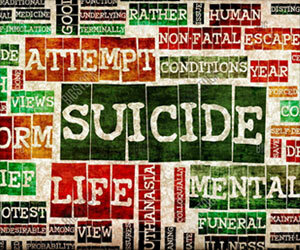 Also, nearly half of all adults who die by suicide saw a primary care clinician within the month before their deaths. "Those statistics led us to ask, 'Is there something primary care providers might be able to do or say in office visits with men to change that outcome?" Jerant said. "In answering that question, MAPS was launched." "Reducing suicides will take a united effort that extends beyond the primary care provider's office," Jerant said. "Our insights could be useful to prevention efforts worldwide." A research has found nearly one-third of youth ages 10 to 12 years screened positive for suicide risk in emergency departments.